After graduating from Merrimack College in 1999, Steve, a Newport, Rhode Island native, was first elected to the Newport City Council in 2001 at age 24. 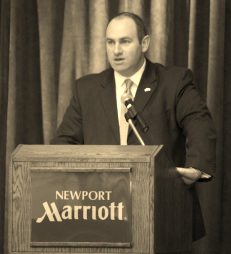 On January 2, 2007 he was sworn in as the youngest Mayor in the history of the City of Newport. After serving nearly 4 years as Mayor he resigned to to assume the position of Chief Clerk of the Rhode Island District Court which gives him the authority to conduct wedding ceremonies. Steve is an active parishioner of St. Augustin’s Church, a member of the Ancient Order of Hibernians, Newport Knights of Columbus and on the board of directors of the Rhode Island ALS Foundation. In addition he is the Chairman of the Rhode Island Turnpike and Bridge Authority. In his spare time Steve enjoys spending time with family and friends, going to the beach, rooting for the Red Sox, Patriots, Celtics and Bruins and most of all walking his dog Sydney all over Newport.